I finally made it to Ogden and went to Brown’s Fort to find the old Pear tree. It is now called Fort Buenaventura and is a state park so of course I just hopped in the car and drove up there, after all state parks are always open and eager to help. Imagine my surprise when I found a big gate across the entrance with a sign that said "Park Closed." I immediately got on my phone to look up their hours and there was nothing on their website that had any type of hours. I called and only got a voice message that said to leave a message. hmmfff! So I did the only thing a normal person would do. I walked into the park. It was a a beautiful warm fall day and there was not a single person in sight. It was a little eerie and I felt kind of uncomfortable being all alone. The picture above is a shot from the top of a small hill looking down on the fort and park. You can see how deserted it is. From my research, this is what I found out about the pear tree before going to the park. Brown’s Fort is the first Mormon settlement in Ogden, Utah. The 160-year-old pear tree that is planted on the site does not bear fruit anymore. But you can still pick pears from ten-year-old tree grafted from the historic pear nearby. I managed to find the younger lone pear tree by the fort and take some pictures but I could not locate the oldest pear tree. Maybe if I go in the summer when they are open they can help me. Well, at least I learned a little about this historic pear and a little about the disorganization of our parks system. I definitely will be back to Fort Buenaventura State Park, even in its loneliness, it was beautiful. 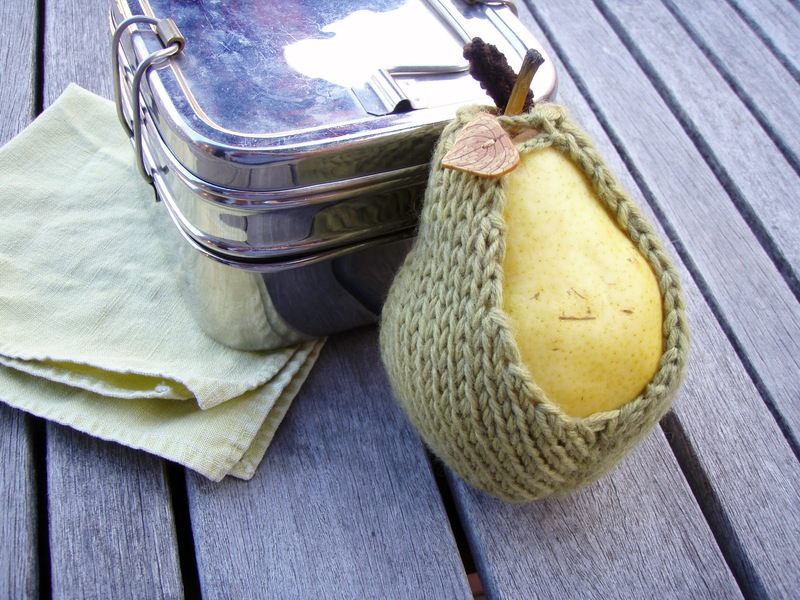 I managed to write up my pear cozy pattern as well. It and the Cottam's Acorn Hat are both on my pattern page. I will be on the lookout for more historic trees. But in the meantime, I better get back on track to finish the many other patterns I am in the process of creating. I really enjoy your work. It's a blast of fresh air. I'm french and a faithful reader, thus I learn English and I discover your country. Thank you very much for sharing your inspiration. Thank you for your lovely comments. I am glad you are enjoying my blog. Even though I live in Utah, I am learning so much by doing this blog that I am sad I didn't start sooner. Maybe someday you can visit Utah, too. It really is a beautiful place! Cute! Where did you get those buttons? I got them years ago at a now-closed sewing store. I wish I could fine more!